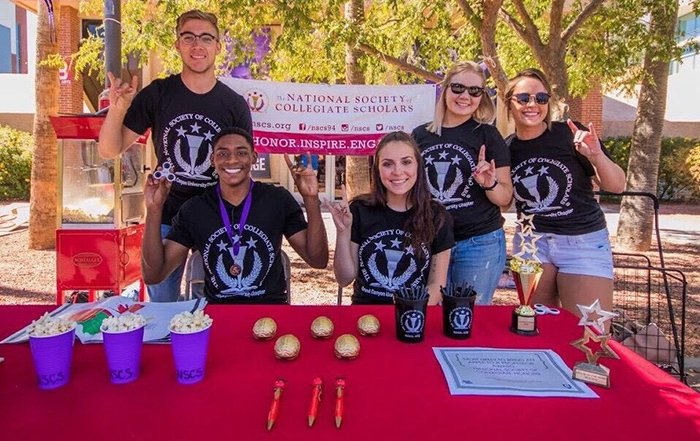 Collegiate Scholars chapter grows to largest in U.S.
Members of GCU’s National Society of Collegiate Scholars chapter, which has more than 4,000 members. 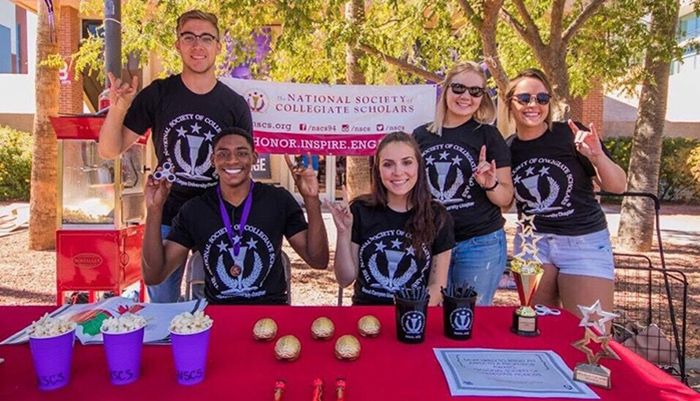 In just four years, Grand Canyon University’s chapter of the National Society of Collegiate Scholars has blossomed into one of the society’s esteemed programs. The GCU chapter has been awarded with the Society’s Platinum Star Status. And as of Tuesday, it has more members than any university in the country. Emily Ghena, former president of GCU’s NSCS chapter. 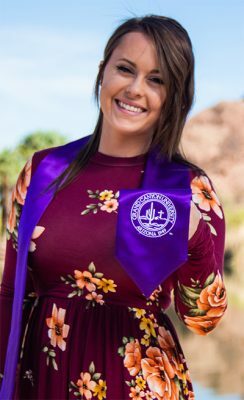 Breanna Naegeli, Assistant Dean of the GCU Honors College and the chapter’s sponsor, said more than 1,000 members were inducted in the spring. The chapter was one of 11 of 320 nationwide to receive Platinum Star Status. The chapter has grown to more than 4,000 members since it was founded in the fall of 2014. An annual induction ceremony each fall regularly draws more than 500 students. Naegeli credits much of the growth to Emily Ghena, last year’s chapter president. Ghena graduated from GCU in the spring and works in admissions as a program development specialist. She spent two weeks at the end of her undergraduate studies putting together a 45-page application for the award. It was the chapter’s first attempt at Platinum – and the students got it. “I feel super humbled and blessed to work with such a great chapter,” Ghena said. When selecting its winners, the society takes into consideration member engagement, officer leadership, new member recruitment, fundraising for various nationwide initiatives and involvement with the Integrity Week campaign. Ghena said the chapter fundraised for the Society’s partnered cause, Active Minds, which raises mental health awareness in college students. GCU President Brian Mueller poses with members of the University’s NSCS chapter. 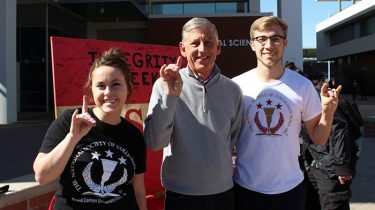 It also participated in Integrity Week by creating a banner that people on campus, including GCU President Brian Mueller, signed to pledge their intentions to act with integrity. The chapter’s next milestone is to achieve Diamond Star Status, awarded to just one chapter each year. Earlier this year, Ghena was honored as the Society’s Region 5 Chapter Officer of the Year. Naegeli was awarded the Region 5 Chapter Sponsor of the Year and received the Inspiring Integrity Award. GCU alumna Brianna Samonte also received the Society’s Inspiring Integrity Award. She was the chapter’s secretary last year. To join, students must have a cumulative grade-point average of 3.4 or higher and must have completed between 12-60 credits. Any student who meets the member eligibility requirements will be invited to join GCU’s chapter. Interested students can reach out to Naegeli at GCUHonors@gcu.edu.